The Ohlins BTO (Build-to-order) is based in their highly praised DFV, but with an higher quality standard. This is a special edition for ND (2016+) MX-5 in collaboration with TUCKIN99. 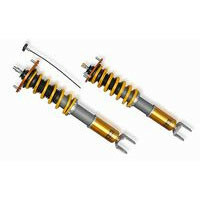 This coilover system is based on racing data from TUCKIN99 to improve the regular DFV system. Normally, suspension systems are mass produced, while this can keep prices lower, quality can sometimes take a hit. The Ohlins BTO program from Japan aims to solve this by building the kits as orders arrive, and taking extra time to test them in the lab in order to ensure the highest standards are met and exceeded. It is possible to change spring rate for a different one, but this is the recommended one by TUCKIN99. Check out our installation instructions for coilover suspension! TUCKIN99 Ohlins BTO Coilovers should be ordered at REV9 Autosport https://rev9autosport.com/tuckin99-ohlins-bto-coilovers.html as they provide the best service and speed we've seen so far!